Enjoy Chinese cuisine at BaiWei Chinese Restaurant, one of the resort's 4 restaurants, or stay in and take advantage of the 24-hour room service. Relax with a refreshing drink at the beach bar, the poolside bar, or one of 2 bars/lounges. Buffet breakfasts are available daily from 7 AM to 11 AM for a fee. With a stay at Mei Du Hotel, you'll be centrally located in Sanya, within a 5-minute walk of Sanya Bay and Coconut Dream Corridor. This hotel is 3.6 mi (5.9 km) from Dadonghai Beach and 14.3 mi (23.1 km) from Yalong Bay. With a stay at Sanya Hawaii Hotel in Sanya, you'll be within a 15-minute walk of Dadonghai Beach and Dadong Sea. This 4-star hotel is 3.4 mi (5.5 km) from Sanya Bay and 13.9 mi (22.4 km) from Yalong Bay. The property is located near Chunyuan Seafood Square and Sanya Pedestrian Street. The Sanya Phoenix International Airport can be reached within a 30-minute car ride. The hotel offers a wide range of facilities ensuring its guests a comfortable stay. The staff can arrange tour/ticket assistance, event catering and business services. Further amenities include a casino, concierge desk and gift shops/news stands. Guest parking is complimentary and available on a limited first-come, first-served basis. In addition to a lobby area with lift access to the upper floors of the hotel, further facilities available to guests at this air-conditioned 368-room establishment include a bar, restaurant and a laundry service (charges apply). Those arriving by car may leave their vehicles in the hotel car park. The 368 air-conditioned guest rooms include minibars and safes. Rooms are equipped with LCD televisions with satellite channels. All accommodation units provide desks, ergonomic chairs and direct dial telephones with free local calls (restrictions may apply). Guests can use the in-room complimentary wired high-speed Internet access. A private bathroom with a shower is a further standard feature. The hotel has a marina, outdoor swimming pool and a gym. Dining options at the hotel include 4 restaurants and a bar/lounge. Crowne Plaza Sanya Bay is The Place To Meet, for work or holiday in your next visit to Sanya.Conveniently located at the west of Sanya Bay and 10KM from Sanya Phoenix International Airport, we are close to attractions like The End of Earth, Nan Shan Temple and Ming Zhu Plaza. Travel easily to other parts of the city with the nearby Sanya Bay Road or readily available taxis in the neighborhood.Crowne Plaza Sanya Bay boasts 1132 sq.m of flexible event space in 8 meeting rooms, including a grand ballroom that seats up to 380 guests (banquet-style). Let our Crowne Meetings Director customize our facilities to suit your event’s needs, whether it is an elegant poolside cocktail, relaxing champagne brunch or grand wedding dinner. Crowne Plaza Sanya Bay master chefs will craft full banquet menus, tailored buffet spreads or elegant tea breaks for your events. To rejuvenate, try a few laps in our outdoor swimming pool, workout in our modern Fitness Center or relax with a massage in our tranquil Spa. Treat yourself to the finest cuisines at our signature Shan Hai Lou Chinese Restaurant, Noodle Store and Dan Jia Seafood Restaurant or in our all-day dining Star Cafe. Then relax with an evening cocktail at Breeze Bar.Be it for vacation or work, make Crowne Plaza Sanya Bay your first choice for your next visit to Sanya! Dip into one of the 2 outdoor swimming pools or enjoy other recreational amenities, which include a fitness center. Additional features at this resort include complimentary wireless Internet access, concierge services, and gift shops/newsstands. Relax and unwind with body treatments and facials. You're sure to appreciate the recreational amenities, including hot springs, an outdoor pool, and a fitness center. Additional amenities at this Art Deco hotel include complimentary wireless Internet access, concierge services, and shopping on site. 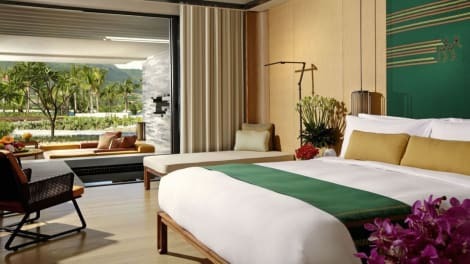 A picture of stylish, serene beauty, this Sanya hotel resort is nestled between pristine beachfront on one side and scenic mountains on the other. An eco-friendly oasis with extensive water features and lush gardens, this Sanya hotel offers 343 rooms including 24 beachside villas, and guests can lounge in five swimming pools, dine in 6 restaurants and bars, unwind in our soothing SPA InterContinental or choose from one pillar free ballroom and seven inspiring meeting rooms. Grab a bite to eat at one of the hotel's 2 restaurants, or stay in and take advantage of the 24-hour room service. Snacks are also available at the coffee shop/café. A complimentary breakfast is included. 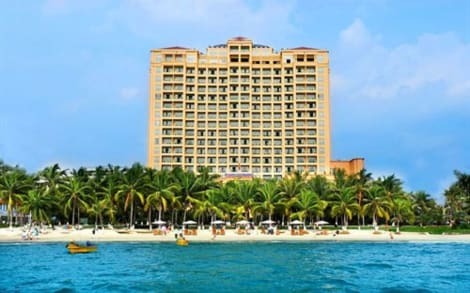 InterContinental Sanya Haitang Bay Resort is nestled in a scenic paradise surrounded by mountains and a tropical lagoon. The luxury resort is beautifully landscaped with lush tropical plants and foliage as well as perfectly manicured lawns. One of our unique features is a large sea water aquarium and its restaurant, AQUA. You can simply relax in our guest rooms with spectacular ocean views or enjoy shopping at the Sanya Duty Free Centre. 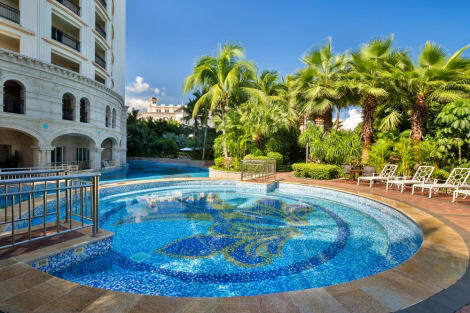 lastminute.com has a fantastic range of hotels in Sanya, with everything from cheap hotels to luxurious five star accommodation available. We like to live up to our last minute name so remember you can book any one of our excellent Sanya hotels up until midnight and stay the same night.